The Maxx Products Folding Yoke Type Spinners have available replacement collets if you need a unit to fit a different shaft size than the collets that are included. Those are all listed with the APC type folding Maxx Spinners. Direct Link To: APC Type Folding Spinners. Nose of spinner is ventilated to aid in cooling. Included collets to fit motor shafts 3.2mm (1/8") and 4mm. For other collet inserts see the MPIPFC series part numbers listed at bottom of MPI APC folding spinners (Category: Spinners APC Folding). May be adapted to a wide variety of shaft sizes. Comes in clear anodizing (natural aluminum color) only. Style of spinner is top unit in example photo. Note: *Actual measurements of these spinners show them to be around 35.1mm at the largest diameter. MPI packages and identifies them as 36mm which we left in the name for those looking for that specific spinner. Heavy duty folding prop Spinner/Hub assemblies useful for direct or geared applications. The spinner and the hub are aluminum. 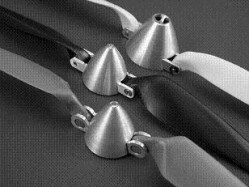 The propeller blades (ordered separately) attach to an aluminum yoke with fasteners (provided). In title above, first number is spinner diameter, second is collet size to fit your shaft and 3rd is width of yoke gap. All measurements given in Millimeters (mm). *Colors we get from the factory (we have no choice) Red, Silver, Purple, Blue, or Gold. We will ship what we have. Heavy duty folding prop Spinner/Hub assemblies useful for direct or geared applications. The spinner and the hub are aluminum. The propeller blades (ordered seperately) attach to an aluminum yoke with fasteners (provided). In title above, first number is spinner diameter, second is collet size to fit your shaft and 3rd is width of yoke gap. All measurments given in Mili-Meters (mm). * Colors we get from the factory (we have no choice) Red, Silver, Purple, Blue or Gold. We will ship what we have. In title above, first number is spinner diameter, second is collet size to fit your shaft and 3rd is width of yoke gap. All measurements given in millimeters (mm). Spinner OD runs in range from about 33.25 to 33.75mm. In title above, first number is spinner diameter, second is collet size to fit your shaft and 3rd is width of yoke gap. All measurments given in millimeters (mm). Spinner OD runs in range from about 33.25 to 33.75mm. *Colors we get from the factory (we have no choice) Red, Silver, Purple, Blue or Gold. We will ship what we have. In title above, first number is spinner diameter, second is collet size to fit your shaft and 3rd is width of yoke gap. All measurments given in millimeters (mm). Nose of spinner is ventilated to aid in cooling. Included collets to fit motor shafts 4mm and 5mm. For other collet inserts see the MPIPFC series part numbers listed at bottom of MPI APC folding spinners (Category: Spinners APC Folding). May be adapted to a wide variety of shaft sizes. Comes in clear anodizing (natural aluminum color) only. Style of spinner is top unit in example photo. Nose of spinner is ventilated to aid in cooling. Included collets to fit motor shafts 5mm and 6mm. For other collet inserts see the MPIPFC series part numbers listed at bottom of MPI APC folding spinners (Category: Spinners APC Folding). May be adapted to a wide variety of shaft sizes. Comes in clear anodizing (natural aluminum color) only. Style of spinner is top unit in example photo.